The Moon doesn't really change in size this much over a few days, but Francisco's presentation simulates what we might see if the Moon were in an elliptical orbit. That would introduce an additional variation, beyond the phases and accompanying different locations in the sky, to make the Moon even more mysterious. For observers, the few days each month when the Moon was near perigee would be prime imaging times, because of the larger image size. Would the phase always be the same near perigee thus always giving better views of some lunar longitudes? 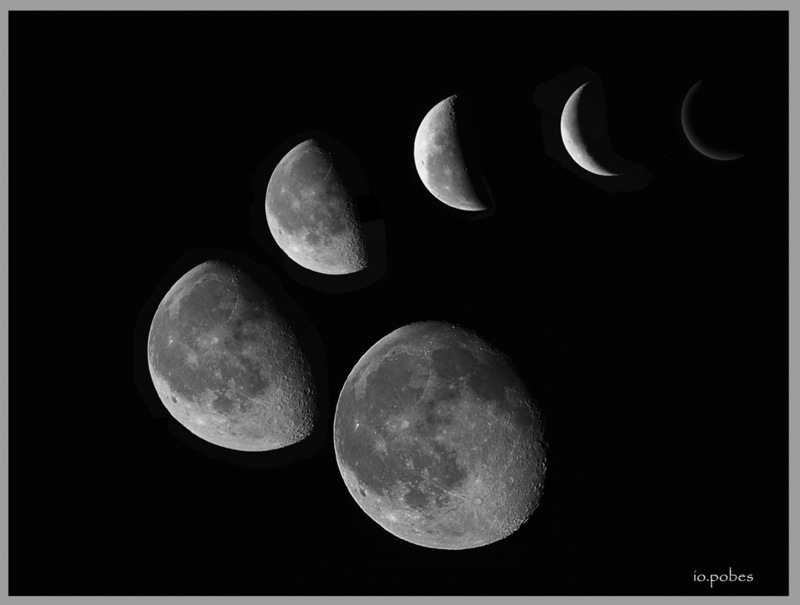 Would the near coincidence of lunar rotation rate and orbital period be maintained, or would they differ, leading to all sides of the Moon being visible? Would eclipses of the Sun be affected, with some having a significantly smaller Moon and a wider annulus, and others being less spectacular because they occurred at perigee when the Moon was large? Many moons in the solar system that are close to their planets are in relatively circular orbits, probably due to tides, but many of the distant satellites of jovian planets have orbits as much as 10 times more elliptical than our Moon; these are presumably captured comets. I appreciate the approximate regularity of our Moon, even though there would be a fascination in more complex orbital movements. Orion Mak 180/2700 with primary focus + canon 350d + neodymium filter. Pixinsigh and retouched with Photoshop. Three images stacked for each final image. This page was last modified on 8 February 2015, at 20:39.